Continuing our Institute theme after our last screening at L’Institute Francais, KinoKlub returns with a mini-retrospective of the amazing stop-motion films of Ladislas Starevich (whose name has undergone various spellings) in the (tiny) Scotland-Russia Forum. As an extra special treat, we are also screening The Making of Longbird, a recent short film by Will Anderson which documents the ressurection of a Russian animated character of the same name. KinoKlub is delighted that Anderson, and perhaps Longbird, will be present at the screening for an informal Q&A. Ladislas Starevich (known as The Insect Man) is a Russian-born early master of stop-motion animation, who was famous for using real animated insects as his main protagonists. 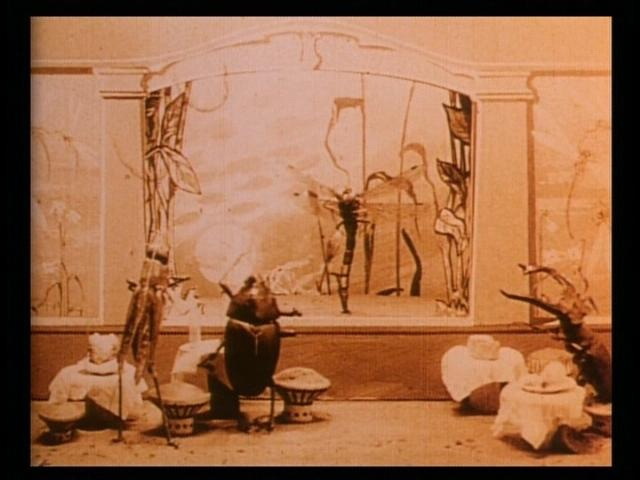 A great example of this is The Cameraman’s Revenge (1912) about a marital dispute between a grasshopper, a beetle and a dragonfly. Another famous work by Starevich is The Mascot (1934), a charming tale of a toy dog that goes on a great journey to find an orange for the little girl who owns it. Long overdue a renaissance, the work of Starevich will continue to delight a modern audience. Both these films are included in the KinoKlub programme. Entry to the event will be subject to a £2 donation, and there will be a donation bar with Russian beer (and perhaps vodka) available. BE WARNED: this space is small and capacity is therefore limited so please turn up early in order to not be disappointed! KinoKlub is a surreal film collective formed by Malgorzata Bugaj and Morvern Cunningham. We committed to showcasing some of the best in surreal film (with an emphasis on animation) from all eras and around the globe on a regular basis. Our screenings are unique, one-off events which explore different spaces around Edinburgh. We seek diverse collaboration with various film-related organizations.